Blackmer® is the leading global provider of innovative and high-quality sliding vane and centrifugal pump, and reciprocating compressor technologies for the safe transfer of liquids and gasses. Blackmer pumps and compressors are used in a multitude of applications in the global Process, Energy and Military & Marine markets. - Industrial process sliding vane pumps. 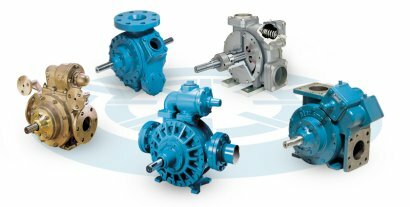 Blackmer offers vane pumps to handle difficult industrial process and chemical applications. The pumps incorporate cast iron, ductile iron and stainless steel materials of construction to for fluids such as acids, refrigerants and solvents. The pumps allow for max flows of 2,220 gpm and max differential pressures to 200 psi. The vane pumps feature self-adjustable vanes and are self-priming. In addition, the process pumps can handle fluid viscosities to 100,000 SSU, and are available in port sizes from ¾ inch to 10 inch. - Truck and Transport vane pumps. The recognized leader in the global truck and transport industry, Blackmer sliding vane pumps are widely used to load, transport and unload a wide range of clean liquids and petroleum products. The pumps offer line stripping and dry-run capabilities. Materials of construction include ductile iron, stainless steel and cast iron to handle lube oil, solvents, biofuels, petro chemicals and more. The transport pumps allow for a max of 125 psi, temperature to 375 degrees F, and flows to 505 gpm. The pumps are available in 1.5 inch to 4 inch port sizes. - Refined fuels vane pumps. Blacker manufactures vane pumps for pumping refined fuels, hydrocarbons and biofuels such as jet fuels, diesels, and gasoline. The pumps feature adjustable vanes for sustained performance and are constructed of cast iron or ductile iron. The sliding vane pumps can handle temperatures to 500 degrees F, viscosities to 100,000 SSU, flows to 2,220 gpm, and differential pressures to 200 psi. - LPG/liquefied gas pumps. Blackmer produces liquefied gas sliding vane pumps to handle liquefied gases such as LPG/propane, butane, CO2, refrigerants and NH₃. The pumps are capable of max flows of 350 gpm and differential pressures to 200 psi. Blackmer’s System One heavy-duty centrifugal pumps are designed for high volume, severe duty applications in industries such as chemical process, biodiesel production, mining, wastewater, liquid terminals and more. System One pumps are manufactured in Ductile iron, 316 stainless steel, CD4MCu, A-20 and Hastelloy® materials to able to handle harsh fluids. The pumps have flow rates up to 4,500 gpm, can operate in temperatures to 750 degrees F, and are available in metric and ANSI models. Blackmer is the leading global provider of innovative and high-quality sliding vane and centrifugal pump, and reciprocating compressor technologies for the transfer of liquids and gasses. For more than a century, the Blackmer name has stood for unparalleled product performance, superior service and support, well-timed innovation and a commitment to total customer satisfaction. Supported by a worldwide network of distributors and original equipment manufacturers, Blackmer pumps and compressors are used in a multitude of applications in the Process, Energy, Transport and Military & Marine markets. Blackmer – headquartered in Grand Rapids, Michigan, USA - is a member of Dover Corporation’s Pump Solutions Group (PSG®).